Suggested Use: 1 or 2 tablets daily or as directed by a health care professional. Osteo Forte Orotate is a combination of the orotate salts of calcium, magnesium, and zinc, along with vitamins B6, C, and D, boron, silicon, and other minerals — substances chosen because of their known effects on bone health. All of these substances are normally found in the body, but rarely in optimum amounts. Accordingly, we will limit our discussion of Osteo Forte Orotate to a brief summary of relevant research, and let you draw your own conclusions about what medical conditions it may be effective in treating. Osteo Forte Orotate was formulated with bone health in mind. Each of the ingredients, however, has its own individual merits in other areas of health. It therefore makes sense to use this product as a broad-purpose supplement and not just for its effects on bones and joints. Orotate mineral salts were popularized as supplements by Dr. Hans Nieper, the innovative German physician,67,8 In particular, he used calcium orotate for: who used them to treat many different conditions. 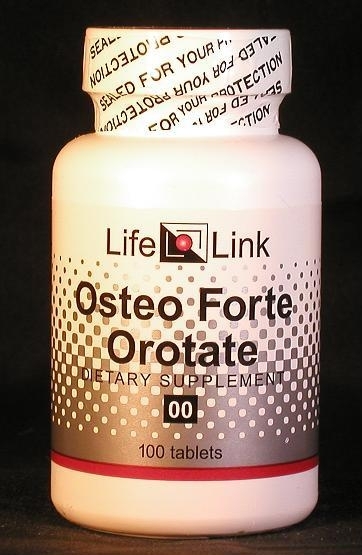 For more detailed information on the orotate supplements, see the product descriptions for LifeLink’s Calcium Orotate, Magnesium Orotate, and Zinc Orotate. The element boron has been shown to be important for preserving bone strength and is also considered appropriate for treating arthritis.11,22,23 But people’s intakes of dietary boron vary widely,12 averaging around 2 mg/day13 — whereas 3 to 10 mg/day seems to be indicated for maintaining bones and joints.14 LifeLink’s Osteo Forte Orotate therefore includes 5 mg of boron per tablet. It has been known for decades that the mineral silicon plays a significant positive role in bone formation and maintenance.15 Severe silicon deficiencies are probably rare, but many people consume less than the optimum amount of this element — average consumption is about 30 mg/day. A 2007 study revealed “large differences in BMD (up to 10%) between the highest (>40 mg Si/day) and lowest (<14 mg Si/day) quintiles of silicon intake.”16 BMD (bone mineral density) is a measure of bone strength. Silicon should therefore be included in all supplements aimed at improving bone health — LifeLink’s Osteo Forte Orotate contains 23 mg of silicon per tablet. In addition to calcium, magnesium, zinc, boron, and silicon, a number of other vitamins and minerals are important for maintaining bone strength. These include phosphorus, potassium, fluoride, manganese, copper, iron, zinc, and vitamins A, B, C, D, and K.17 Some of these are present in adequate amounts in the average diet; those that are not, but are needed in only tiny amounts, are included in this product as ‘trace minerals’. Is our Osteo Forte Orotate supplement useful for the conditions and purposes mentioned above? We aren’t allowed to tell you, so you should take a look at some of the references cited here, and then decide for yourself.